I’ve just finished Sarah Martin’s recent biography on Davis McCaughey. For those unfamiliar, McCaughey was a defining figure in the formation of the Uniting Church, personally drafting much of the Uniting Church’s foundational document, the Basis of Union, and then becoming its inaugural President. For twenty years he was Master of Ormond College in Melbourne, beginning as Professor of Biblical Studies, having emigrated from Ireland with his wife and family in his thirties. Then, in 1986, he was appointed Governor of Victoria. 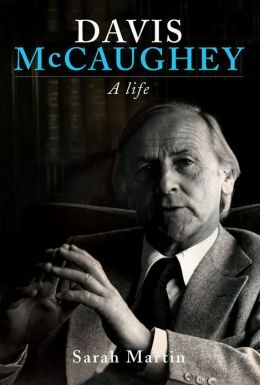 His is a fascinating life, and I particularly noted among his many attributes the ability to articulate faith and values credibly into the Australian public square. I’m struck by his eloquence, which was deeply informed by his avid love of poetry. It’s also interesting to see how how much of his ecumenical energy was probably energised by his Irish roots. Although Martin doesn’t give a detailed exploration of the process of church union, we do pick up his significant role within it. It is interesting also to note his friendship with missional thinkers such as Leslie Newbigin, and how they saw the ecumenical movement as a missional imperative. He became something of an Australian renaissance-statesman, seemingly able to remain in step with the shifting intellectual life of Australia throughout the secularising 1970’s; and then delivering the Boyer Lectures in 1987. As an educationalist, he saw philosophical and humanistic study as a vital compliment to science and technology, and believed all students should engage some level of literature and poetry as a means of understanding human nature and our social context. In step with the ever more confident emerging Australian intellectual art and literature set, his view was that “we need them all” in order to grow a transformed and enriched Australian imagination, “without which we are unlikely to acquire a shared vision”. The impact of his personality and ministry is considerable within the Australian and worldwide church, several decades of students, and the broader Australian intellectual life. I strongly recommend it, especially for those unfamilar with the man, new to the Uniting Church (or indeed long part of it), or interested in Australian church history. Category : Church, Uncategorized, Uniting Church, Uniting Church in Aust.